Hi guys, it's Pikachuwee again! I recently found out that Acronis Disk Manager has a Boot Manager option that allows you to easily dual boot Operating Systems. You see, I installed Linux AFTER Windows Vista, so the default Boot Manager is GNU Linux. I installed Acronis Boot Manager and it only shows Linux as a bootable OS, when I "booted" it, it displayed the GNU Linux Boot Manager, I WTF'd. A boot manager in top of a boot manager? I want to boot Linux OR Windows Vista with the Acronis Boot Manager. I want it to show Windows Vista AND Linux, when I click on the Linux OS, it shows the Linux Boot Manager where I boot Windows Vista. I can uninstall it easily and keep my Linux boot manager, but I want to improve to a better one, I can boot Windows and Linux so I there's no rush. As I recall, the OSS has to be installed on a different partition than Vista; any other partition will do. Thanks! I'll do that now. Is it the tool that allows you to discover new OSs? I have no idea. OK, assuming you installed the OSS on the same drive as Vista (reason it's not working), you need to UN-install it from there and reinstall to a different partition. Best is to use an 'empty' partition that your not using for anything else (otherwise it might get lost when you restore backup images) but any other partition will do (any file system is ok). You'll need to reboot to your 'normal' OS after this (the one where Acronis DD10 is installed). 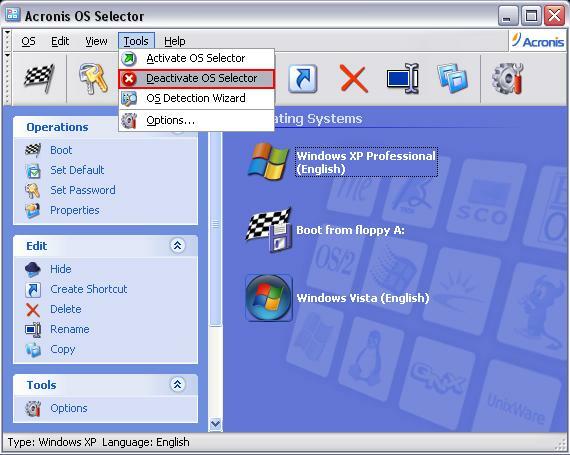 or, easier, just delete the files (saves reboot), you'll have to go to Tools - Folder Options - View and choose 'Show hidden files...' and UN-check 'Hide protected operating system files' to see the BOOTWIZ folder and bootwiz.sys which you need to delete. Is it ok to make a new 50 MB partition for the OSS installer? Sorry for the edit, I didn't wanted to double post (I moderate a site, I've been trained to merge double posts). Yes, this will work fine and can be located anywhere on the hdd. I am in a fix, when I did what you told me, I rebooted my computer and AOSS could not find ANY OS! I freaked out, I couldn't boot Windows Vista nor Linux, luckyly I still had my Linux Sabayon Live Disc (phew!) and I can now have full access to my HDD. I installed the AOSS on Drive "D:\". While on the Linux Live CD, I deleted the BOOTWIZ.sys and the BOOTWIZ folder from Drive D:\ and when I rebooted, it said "AOSS could not find the necessary files" and my computer blacked out with a continuos beeping sound (ANNOYING). 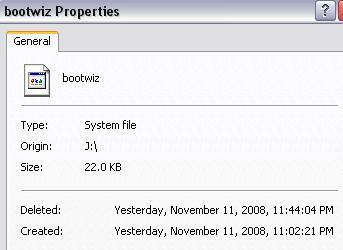 I found a BOOTWIZ folder in my C:\ , but I could not find a BOOTWIZ.sys, will deleting that folder help? No files were touched when I installed AOSS. if you are going to continue fiddling with hard disks, MBR's and boot managers, you'd better get used to it and keep calm , this is not your first time (and it won't be the last ). So, just post some info on how the disk(s) are partitioned, how the partitions are (were) seen by both VISTA and Linux, filesystems used, Primary/Logical inside extended, etc., etc. Yeah I freaked out a tiny bit since the computer emitted these really loud beeps lol. Anyways, before Acronis, my computer booted with a GNU GRUB boot loader, it booted my Linux OS and my Windows OS. 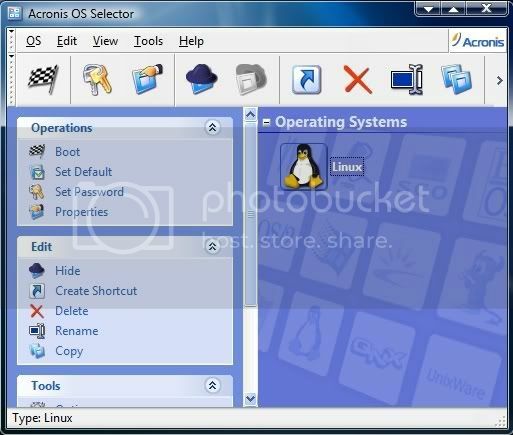 I installed the AOSS (Acronis OS Selector) today on my C:\ but it only displayed Linux (which was the bootloader that loaded both, Linux and Windows), I posted this thread to know how is it possible to boot Linux or Vista directly using the AOSS without touching the GNU GRUB boot loader. I uninstalled it from my C:\ and then installed the AOSS on my temp file D:\ and when I rebooted, it could not find any OS, I luckily found my Linux Sabayon Live CD collecting dust on my book shelf, I booted it using the BIOS and I finally could only ask for help. There is a BOOTWIZ folder in my C:\, I am guessing that's causing the problem (I already deleted the BOOTWIZ folder/BOOTWIZ.sys in my D:/) but I am not doing anything before knowing if that's the problem. 1)The BOOTWIZ folder in my C:\ might be the problem. 2)It boots AOSS on boot (There are no OS displayed so I can't boot). 3)Deleting it might resolve the problem. Hmm, I guess some not so slightly clarifications need to be made. You mean of course grub4dos, which is derived from, but NOT GNU GRUB. Well, you may have been thinking of installing it to C:\ but most probably you actually installed it in the MBR (+hidden sectors) and/or in the bootsector of the partition. That's just my view on the problem, I am not an expert in booting but it is common sense. It shows how my HDD is formatted and the partitions it has. I don't know much about Acronis, but shouldn't the partition be an Active one and a Primary one? If not, it means that something has been changed in the MBR (and possibly hidden sectors too). So jaclaz, what do you suggest I do? format D:\ ? The files you deleted should still be in your Recycle Bin and will show you infos in properties to confirm where they were deleted from; simply restoring (copying back) these files should resolve this issue (assuming you haven't done additional things in the hours waiting for the server to cooperate). I was suggesting to format the new partition, the one around 50 Mb, and install OSS to it as Amalux told you. You do realize that we have NO way to know for sure what is your "C:\" or "D:\" or ANY other drive letter since the only info that you posted is a gparted screenshot (where partitions are named /dev/sdan? The problem is, I can't install OSS again since I can't boot Windows. Sorry it took so long, the site seems to be having server problems. Sorry, I am using the Linux Sabayon Live CD and when I deleted the files (which I thought it was going to relieve the problem) they went to the trash can that gets cleared everytime I reboot. Now OSS gives me an error on boot and I can't boot at all. PS: Sorry for the double post. Do you have any means of running DD10 in LiveXP, Acronis Rescue Media, other bootable part?? etc. Do you have the partition where you deleted the files backed up with TrueImage or similar? Then boot back to Vista and reinstall Acronis from fresh? fwiw, If you delete all instances of BOOTWIZ folders and bootwiz.sys files from every partition, you should be able to boot normally to your primary OS; if you have more than one active OS, you should probably hide the other partitions till all is setup right again; you may get warnings from OSS at reboot 'drive not found' but that's OK, just the hidden drive(s). Once this is done and you can boot normally to your primary OS, let me know for further instructions! I don't see any reason to loose your existing installs/data! (Jaclaz, OK?) Just bear with me and this FRACKIN' SERVER! Data is the only thing of value! If you care about data on your hard disks, backup. Even if you don't, backup as well. In case of doubt, backup. And this applies PARTICULARLY before fiddling with partition utilities, bootmanagers and the like, EXPECIALLY if you don't (yet ) know where your towel is. EVEN if you are known as a hoppy frood, BACKUP. OK, I was finally able to reproduce this issue and FIX IT!! If you can skip the menu, you will boot to whatever your normal OS was and you can clean things up from there! I've tried it every way possible and it works!! The only possible issue would be conflicts between multiple bootable partitions; you may need to hide some of these but wasn't a problem for XP and Vista here. Let us know if that works and I'll walk you through 'cleaning up' the OSS install. NOTE! Don't reboot until you've cleaned up the OSS install or you'll have to 'F6' again past the error. 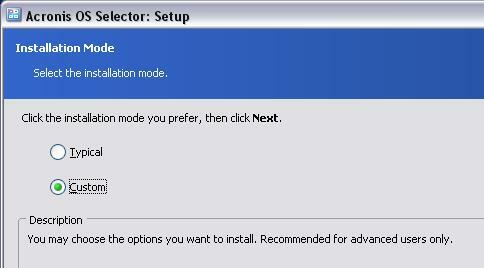 and then choose the partition you want to install to (dedicated 50MB). If you're given the option to Repair, Uninstall etc. you should uninstall, reboot, then 'Custom' install clean. I know this seems complicated and unnerving but it's really pretty strait forward. The problem occurs if you don't uninstall (or install) completely before rebooting, the OSS gets confused (and so do we). Hope this helps!! I'll reboot, skip the menu and boot to Vista and uninstall this mess. Hopefully, I'll be back in Vista again, thanks so much for all your help! EDIT: I could only hear beeps, I wouldn't allow me to skip the menu, the error loaded up I can't skip it. Once you get the OS booted you will want to run the OSS installer and choose 'Repair' option. Even if you want to un-install it (who could blame you), still run the repair first, reboot and then un-install if wanted. I've done this whole process about 10 times now and I assure you it works here. If all this fails, with your limited options, you'll probably want to setup a temporary 'parallel' install to work from and may need to hide all the other partitions while you boot to the new OS, run the OSS installer from there and follow the same repair/uninstall steps above. All this assuming Jaclaz doesn't come up with something better (probably will) and of course, please ask questions as you go so we can help if possible. running OSS installer from LiveXP, seemed to work but same error! Acronis rescue media doesn't include OSS functions. Huh? running bootrec /fixmbr and bootrec /fixboot from Vista DVD. editing OSS bootwiz.oss data and config files in BOOTWIZ. deleting all instances of BOOTWIZ and bootwiz.sys on all part roots.